We are a non-profit 501c (3) no-kill rabbit shelter staffed and run entirely by volunteers. 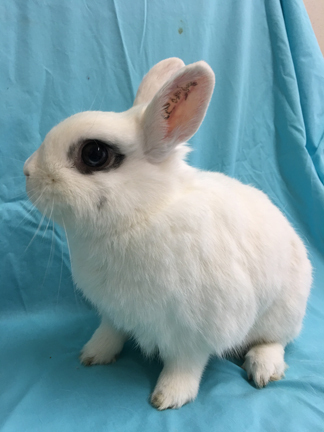 Our goals include the rescue, rehabilitation and placement of abandoned rabbits, as well as public education regarding proper rabbit care and the importance of spay/neuter in battling the escalating overpopulation problem. We rely on public donations and monies made by our on-line store, RabbitShop.com. at 7640 Rosecrans Avenue, in Paramount CA. See who's available for adoption. 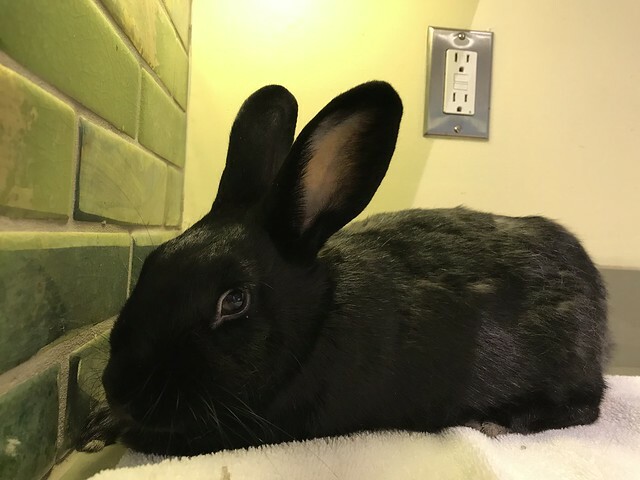 Rabbit Rescue needs your help! 2019-04-14: Slushi is a very sweet and very sick boy! He has got an infection and sludge in his urine, which has made him unable to pee. This adorable boy is gentle, docile and very loving. Even after all his treatments, he still melts into a heap when petted. His vet bills have totaled over $1200.00 and still mounting. We hope to save this boy. Please help by clicking on the Donate button and giving what you can! So far this month Rabbit Rescue has saved 16 rabbits! So far this month we have found homes for 38 rabbits! Our heartfelt thanks to all of you who have helped by donating time or money, or by adopting a beautiful long eared friend into your life! Get more news on Rabbit Rescue's Facebook page. 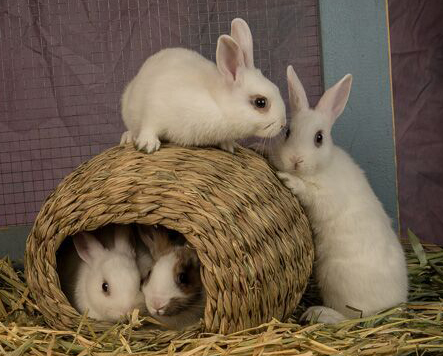 Come meet our charming, adoptable bunnies! We always have a number of healthy, adoptable rabbits looking for homes. In addition to our adoption center, you can visit them in many local area PetCo stores. See our adoptions page for details. Simon is a pint size marshmallow! He is litter box trained. you'll just feel like giving him big hugs! Ears up for Shashin Photography who have generously donated many photos used on this web site! Get your family or pet photographed at Shashin Photography - part of the proceeds will benefit Rabbit Rescue! Get your fix of the best rabbit-themed gifts, and benefit a good cause at the same time. Visit our online store, RabbitShop.com. Use Amazon Smile, and Amazon will make donations to Rabbit Rescue! Make your online purchases at Amazon count by using this Amazon Smile link.